My sister took me to a Thai restaurant for the first time a few weeks ago. I had some Pad Thai noodles with shrimp and a Green Curry dish. It was love at first taste. Since then, I’ve been trying to replicate what I had. 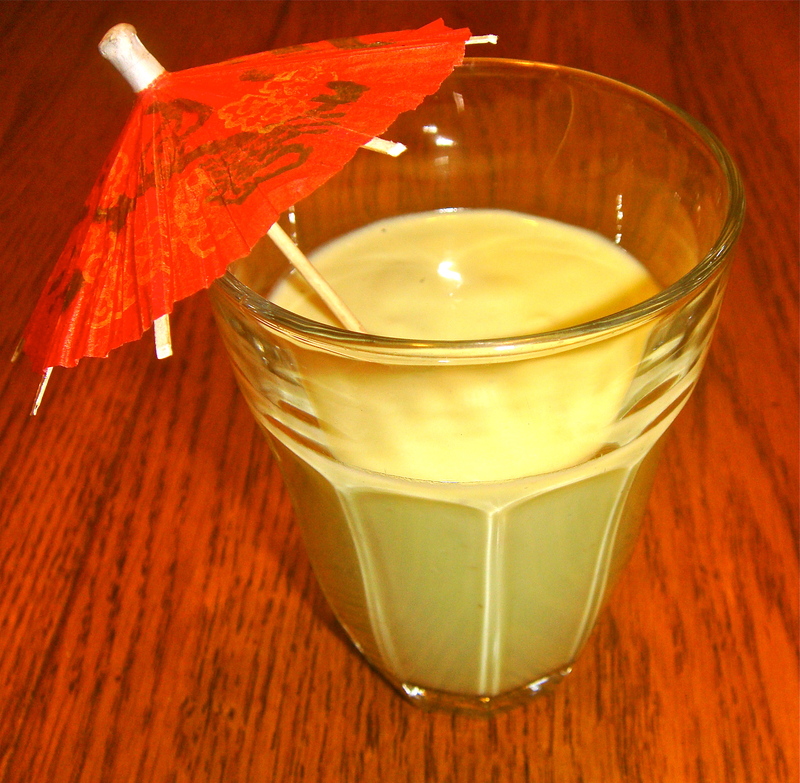 Unfortunately, some of the ingredients were hard to find, so I had to substitute more common foods. As a result, I can’t really call this “Green Curry” (for one thing, the color doesn’t even come close to green), but it was still a very tasty and filling dish. I didn’t have time for it, but it probably also tastes good over a serving of rice. In a pot, heat the coconut oil and sauté the leek and garlic clove for 3 minutes. Add in the carrots, potatoes, zucchini, yellow squash, and sweet peppers. Sauté until slightly softened, about 5 minutes. Add in the beef broth, coconut milk, soy sauce, curry powder, mushrooms, and tomato paste. Bring to a boil and allow to boil for 1 minute. 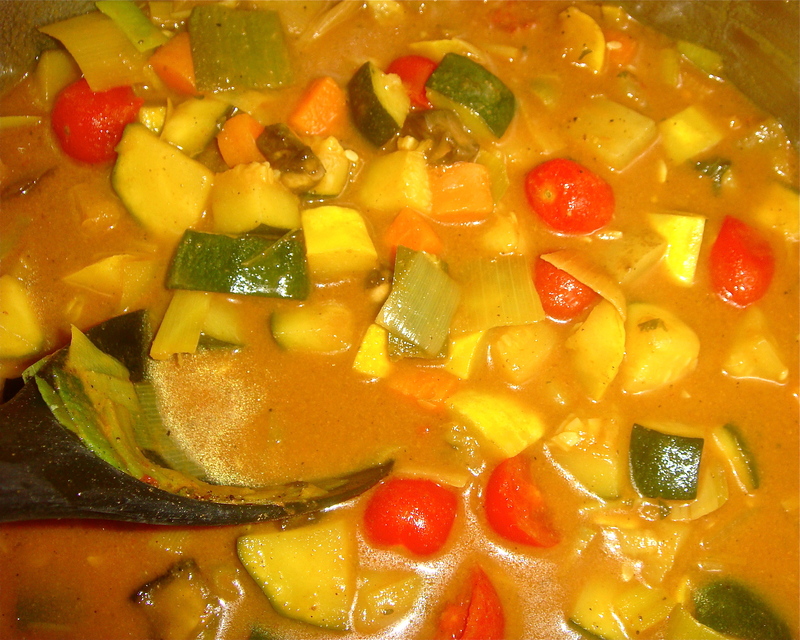 Turn down to a simmer for 20 minutes or until the veggies are tender and have shrunken. Stir occasionally. Add in the tomatoes, lime juice, parsley, salt and pepper and cook for 3 more minutes. If desired, top with chopped chives. 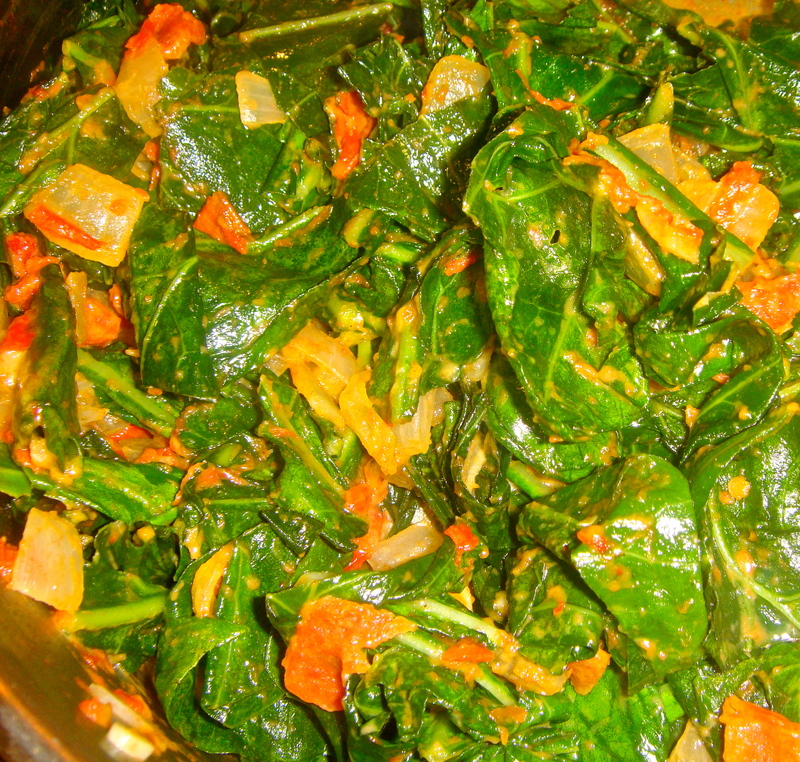 Shred the collard greens (I used kitchen scissors for this) while discarding the tough stems. Set aside. In a deep skillet, heat oil and sauté onions and garlic for 3 minutes. Add in the tomato and pimentos and sauté for another minute. Bit by bit, add in the collard greens and cook them until they are slightly wilted (covering with a lid helps speed this process). Add in the peanut butter and mix until melted throughout. Like for most food bloggers, summer means an abundance of zucchini-filled recipes. My garden is only beginning to pump out zucchini, so be prepared for many squash recipes to come. To start off, I made a squash, fennel, and potato bake. I left the peel on my zucchini and yellow squash because I think the different colors make it much more appetizing and pretty. This was my first time experimenting with fennel. I chopped some up, put it in my mouth, and thought I was going crazy. I then asked my mom to taste some and she thought the same thing: fennel tastes like italian sausage! I don’t know, maybe we are both crazy. Oh well. Good is good. Just a quick note about the Bake- Make sure to cube the zucchini into larger pieces than the potatoes as it will bake faster. Unless, of course, you don’t mind mushy zucchini. I happen to like mushy veggies, but I know some people prefer them a bit more firmer. Preheat the oven to 400 degrees and spray baking dish with cooking oil. 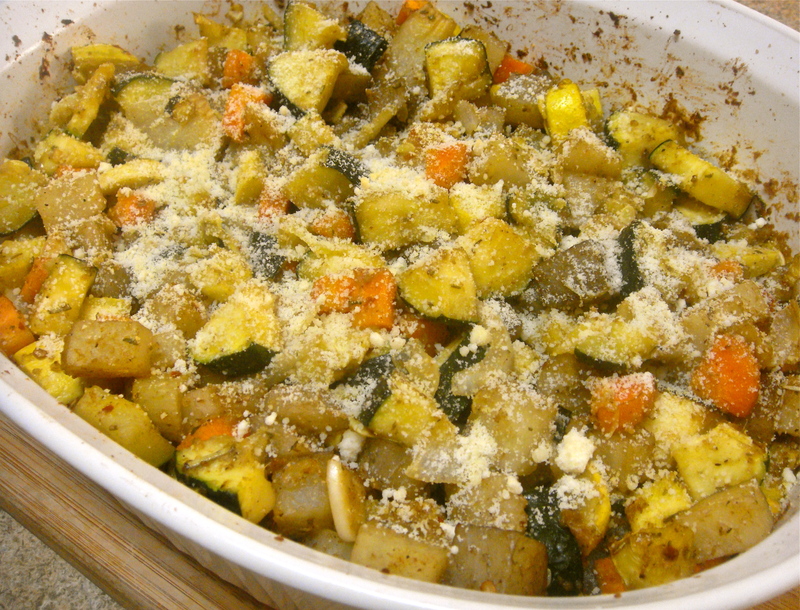 Toss together the potatoes, zucchini, yellow squash, onion, fennel, carrots, garlic, rosemary, thyme, paprika, salt, pepper, and bread crumbs in the baking dish. Add and mix in the olive oil. Spray the top of veggie mixture with cooking oil. Bake for 1 hour, stirring every 15 minutes, until potatoes are tender and lightly brown. If desired, add cheese. Broil for 3 minutes. Avocados! Yum! One of the best foods ever. Both for tastebuds and health. They are also super easy to make a meal with. This time: avocado sauce. Soooo creamy, yet involving no cream, flour, and/or butter at all. It doesn’t get much easier than this. Cook the pasta according to box instructions and set aside. Place all other ingredients in a food processor and pulse until smooth. 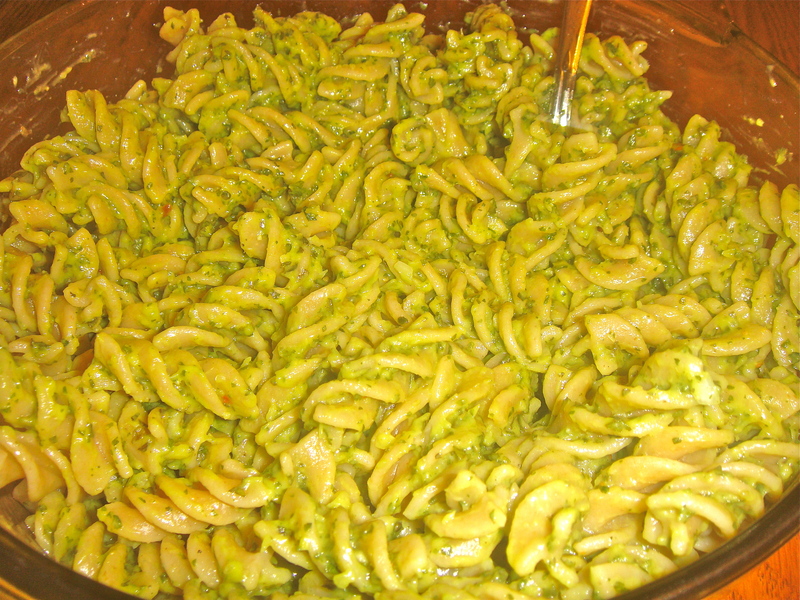 Pour and mix in the avocado sauce with the pasta.